Traditionally an apothecary was someone who made and sold medical ingredients, gave general medical advice and performed a wide range of medical related services. They were the historical equivalent of the modern pharmacist, chemist, herbalist, minor surgeon, midwife and caregiver rolled into one. To learn more about the history of apothecaries please visit our Apothecary History Page! Our apothecary ingredients are hand made and are intended for novelty purposes only. 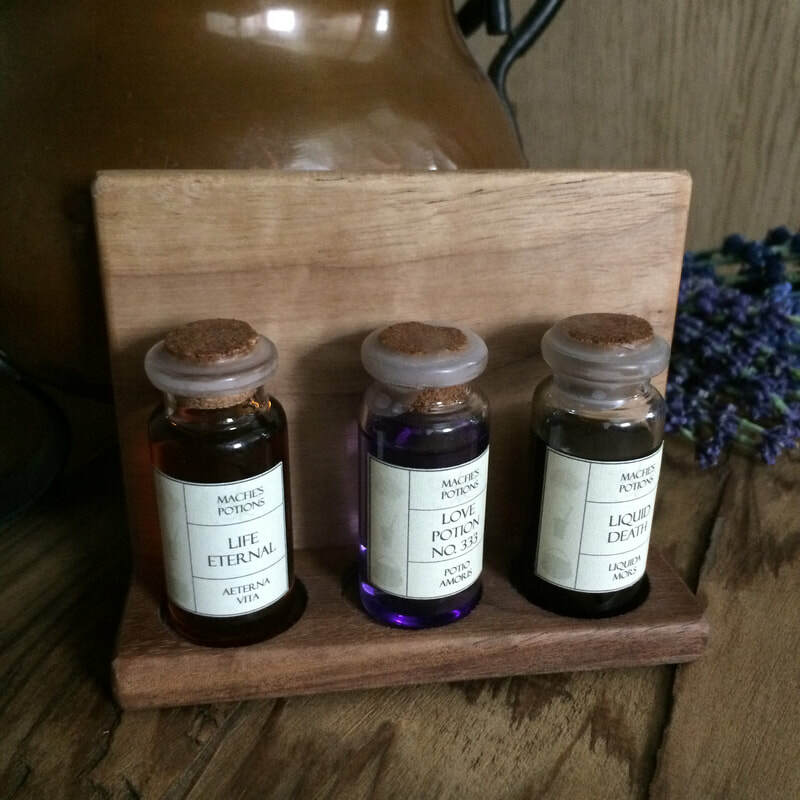 All our apothecary sets come with a 4 x 3 x 1.5 inch hand made black walnut stand. 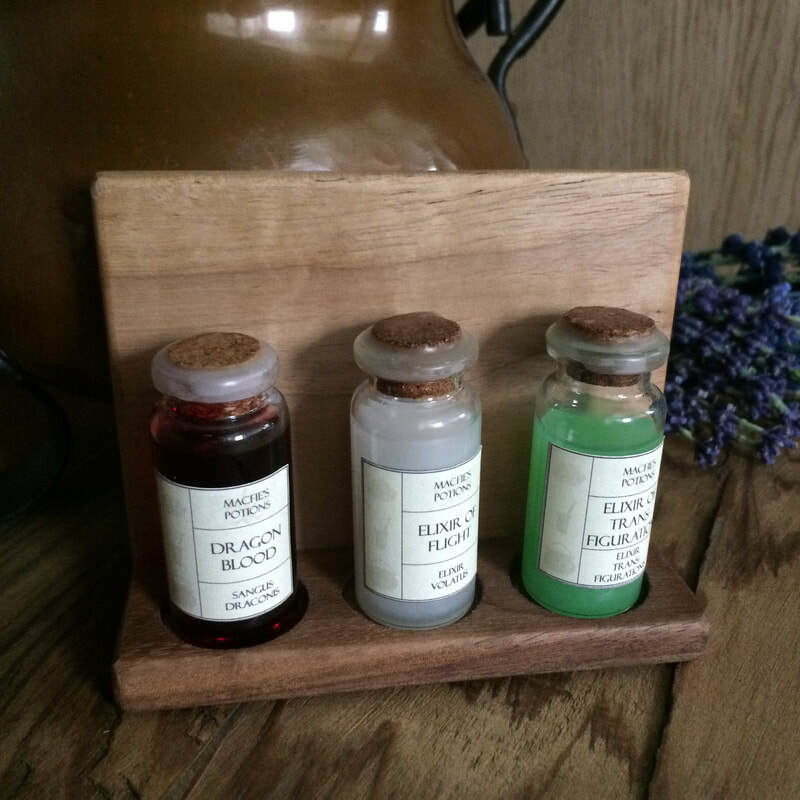 Please choose 3 ingredients to create your own apothecary set! Felt Pouch Necklace - each felt pouch is 4 inches long with approximately an 18 inches string and is designed as a long necklace, but can be shortened if desired. Each felt pouch comes with an ingredient of your choosing. Please choose your desired colour and enter 1 ingredient in the space provided when placing your order. All our potions are hand made and intended for novelty purposes only. Each potion set comes with a 3 x 4 x 1.75 inch hand made black walnut stand. All potions are waxed sealed to give an authentic look. Please choose 3 potions to create your own potion set!